Business premises on Katharine Street, vacant as of August 2018. As of November 2018 this entire stretch is boarded off as part of the Queen's Square redevelopment. 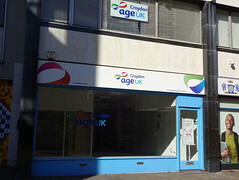 It was previously the main office of Age UK Croydon photo, but this was relocated in May 2018 photo of notice. Last edited 2018-11-24 16:58:12 (version 15; diff). List all versions. Page last edited 2018-11-24 16:58:12 (version 15).